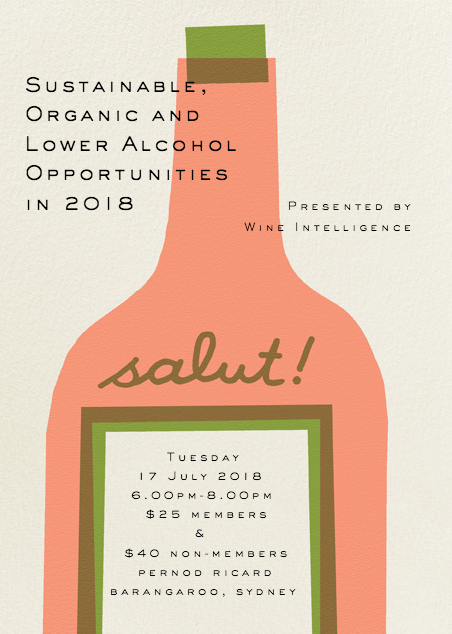 Members and friends of the wine industry are invited to a special presentation from leading wine research and insights agency Wine Intelligence on the trends and opportunities in sustainable, organic and low alcohol (SOLA) wine in 2018. Wine Intelligence Country Manager for Australia and New Zealand Rodney Sammut will present a sneak peek of the 2018 Global Wine SOLA Report which was released in May 2018. The report presents the perceptions and trends of this hot topic in wine, crossing 11 markets and 12 sub-categories. From natural and orange wine, to biodynamic and low-alcohol, the key findings from the 2018 Global Wine SOLA Report will give the industry insights into the markets that these wines have the greatest chance of success in. On the night, enjoy a menu of different drops that fit the sustainability theme, along with specialty cheeses from New South Wales. This will also be a fantastic opportunity to network with enthusiasts and business entrepreneurs in the wine industry.